I absolutely love summer and always have. One of my biggest hesitations about moving to Virginia is the long, cold winters they have up there. I'm from Texas, yall, where the sun is in no short supply. I used to lay out in the sun for hours during the summer. I loved the heat, and I loved the golden tone it brought to my skin. That said, I kinda wish I could go back and slap my 14 year old self for being so careless in the sun. The summer sun is a beautiful thing, but it's also a dangerous thing. I didn't mind getting sunburned because it would "just turn into a tan a couple of days later". My mother lectured us over and over again about wearing sunscreen, and I didn't listen. Now that I am an adult with a hint of rationality unlike the teenage version of myself, I am hearing her message. Skin cancer runs in my family, and I have a good shot of getting it if I keep up my old habits. Gone are the days that I want to lay under the rays for hours on end with SPF 4 on. Let's be real, that doesn't do diddly squat. My health comes first. So, I turned to sunless tanners. I've used quite a few sunless tanners. They all seem to have two things in common. They stink to the high heavens, and they leave your skin looking like a pumpkin. I love the concept of a sunless tanner, but I'm not about the orange thing. If I am going to pay for a sunless tanner, I want it to actually look natural. Enter Rodan + Fields. Lacie with Rodan + Fields is one of the sweetest girls on the planet. She is my sorority sister from college (my newly engaged sorority sister at that! ), and it was so good to connect with her again! 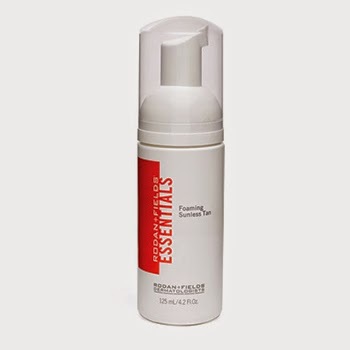 She was kind enough to send me a sunless tanner from the Essentials line, and I really cannot say enough positive things about how well it worked. One thing I really liked about this tanner is that it's a foam. It didn't get my hands messy or stick around like lotion does. I applied it, it absorbed, and I went on with my day. Parker thought I was nuts for saying I could see results in the first 10 minutes, but I promise I could! I applied just before bed, and when I woke up, it was evident my legs were a few shades darker. I plan to do a full body application now that I have the hang of it for Parker's winging in a few weeks. Check out the before and after, and see for yourself! I apologize for the slightly awkward pictures of my legs. I'm not a leg model over here. Isn't that amazing?! I think this sunless tanner gives my legs a noticeably darker appearance without being over the top. I want to look natural, and I think this product accomplished that for me. This sunless tanner did have an odor to it, but I would say it was less intense than the off the shelf brands I have tried. My tan lasted about 4 days, which is what I expected. Lacie was a pleasure to work with, and I highly recommend her to anyone. Another reason she is amazing? She is giving away a free R+F sunless tanner to one Anchors Aweigh reader!! You don't want to miss this giveaway, so enter below! Good luck! I need that sunless tanning foam. It looks like it works amazingly! hands down i would try the sunless tanner! looks fabulous! I can't believe how natural it looks! This could definitely help me look a wee bit tanner in my bridesmaid dress for my best friends wedding! I want to try the sunless tanner. I have been going to the tanning bed to get some color for my sister's wedding. Worst idea ever! Next time, sunless tanners only! I would love to try the redefine daily cleansing mask or the sunless tanner! So many good products! I would love to try the products from the Redefine line! This is the best self tanner look i've seen!! I have GOT to try this!! Um, I need this in my life. I'd so get the sunless tanner. I need color & whatttt? it's a foam? That is awesome!! Thank you for sharing this! My pale legs could definitely use some sunless tanner this summer! I am the definition of pasty - but I just burn when I'm in the sun, so all tans must be fake! I'd definitely like to try a new product. As a red head with fair skin, I know all to well the pains of white legs, sun burns, and stinky self-tanners! I'd love to try this one! I love Rodan + Fields products I have tried in the past, so I would love to try this tanner!! Ok, you aren't giving VA enough credit! I promise you will love it up here! I would love to use the tanning lotion! This product seems really cool! I am about as white as they get, and NOTHING seems to work for me. I'd love to give this a shot! Wow - it looks amazing! Definitely wanna try it out. Definitely the selfless tanner is what I'd love to try.